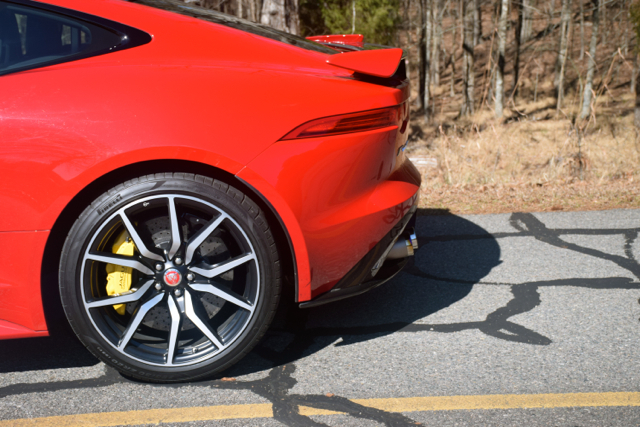 When it comes to the F-TYPE, the SVR tops them all. 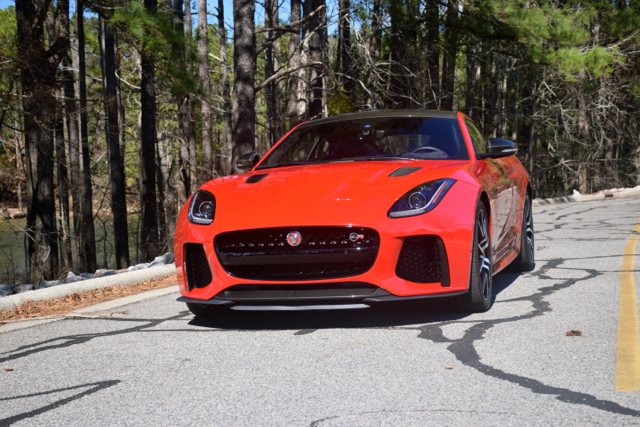 Ever since the F-TYPE leaped upon the world stage in 2014, Jaguar’s sports car has turned heads and invited comparisons to other potent machines, including the BMW Z4, Porsche 911, and the Mercedes-Benz SLK Class, to name a few. Not only did Jaguar seek to build the spiritual successor to the E-TYPE, but in the F-TYPE they wanted nothing less than a world-class scream machine. This writer has had the good fortune of driving no less than four F-TYPEs since the model debuted. The first three appeared within the 2015 calendar year, then nothing for 2016. 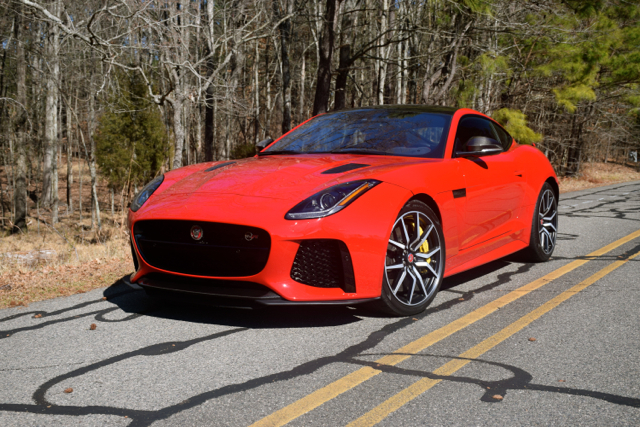 That all changed in mid-February 2017 when the transcendent 2017 Jaguar F-TYPE SVR appeared, the most powerful of the seven trims offered. 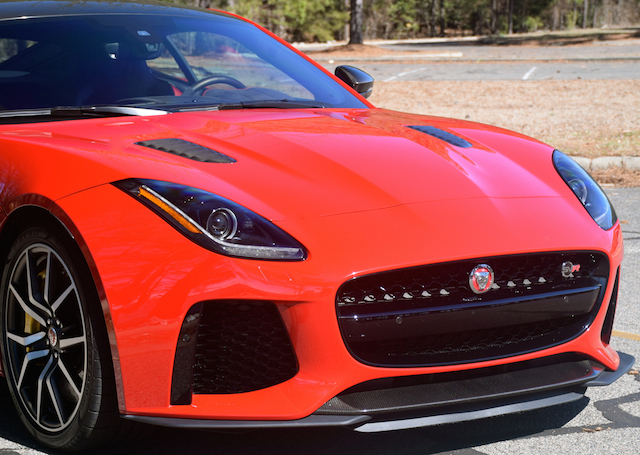 Speaking of the seven trims, Jaguar continues to expand what you can buy when considering the 2017 F-TYPE. 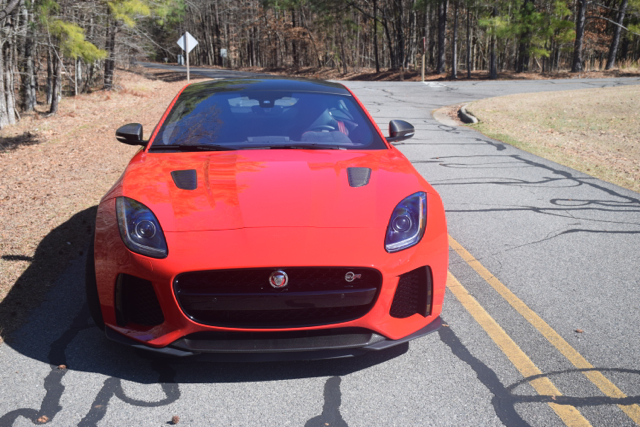 Here you have your choice of F-TYPE ($61,400), F-TYPE Premium ($66,800), F-TYPE S ($79,100), F-TYPE S AWD ($86,600), F-TYPE R ($105,400), F-TYPE SVR ($125,950), and an F-TYPE British Design Edition ($92,100). Add $995 for the manufacturer’s destination and handling charge. 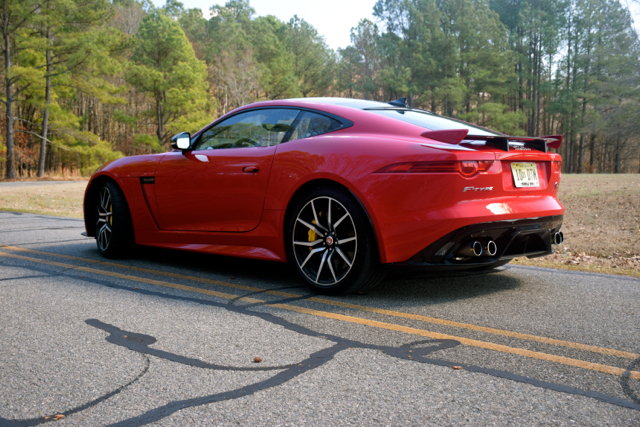 A pair of supercharged engines is offered with the F-TYPE. The base and Premium editions are powered by a 3.0-liter, supercharged V6 engine making 340 horsepower and 332 pound-feet of torque. These rear-wheel drive models are paired with a six-speed ZF manual gearbox or an eight-speed automatic transmission. Expect a 0-60 mph time of 5.5 seconds with the manual and 5.1 seconds with the automatic. Your top speed here comes in at 161 mph. 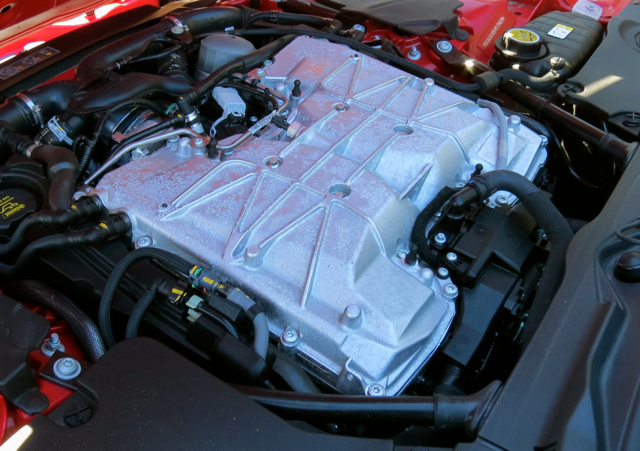 Move up to the “S” and the same engine has an output of 380 horsepower with 339 pound-feet of torque. 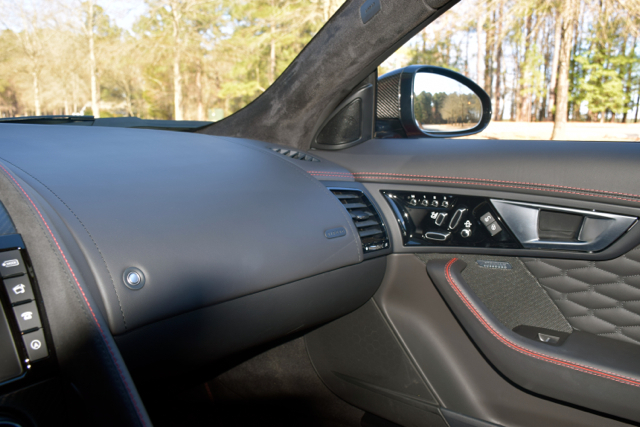 The same manual and automatic transmission combinations are offered. 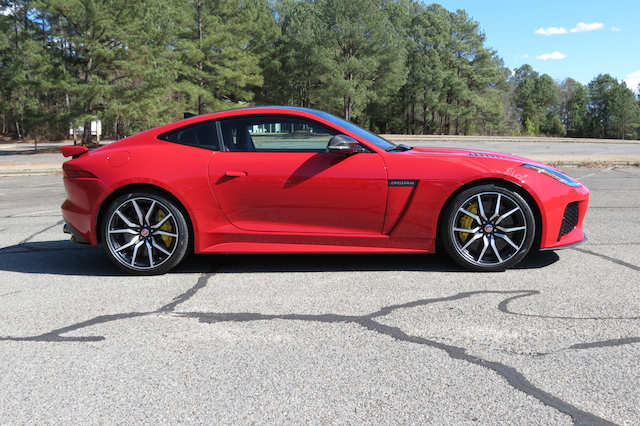 Choose the AWD version and you’ll get Jaguar’s all-wheel drive system. Here, only the automatic transmission is offered. Expect a 0-60 mph time of 5.3 seconds (4.9 seconds with AWD) and a top speed of 171 mph. 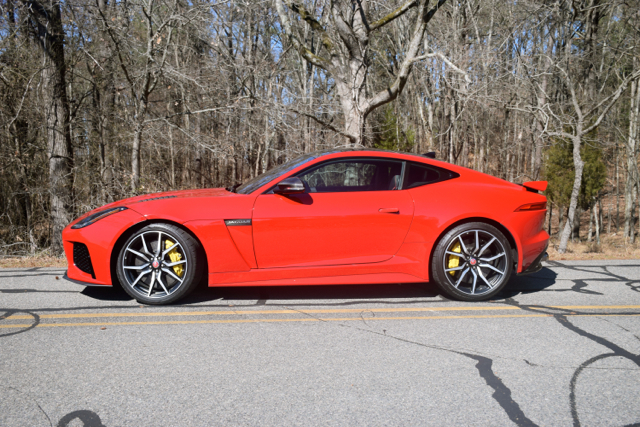 Raucous power comes to the F-TYPE R, powered by a 5.0-liter supercharged V8 engine with 550 horsepower and 502 pound-feet of torque. Paired with an eight-speed automatic transmission, this model has a 0-60 mph time of 3.9 seconds and a top speed of 186 mph. 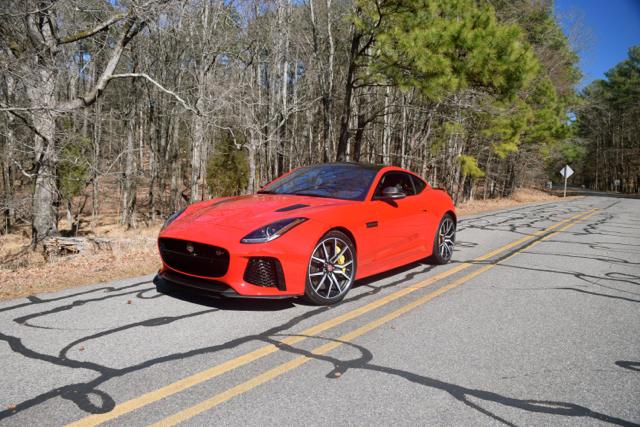 Choose the F-TYPE SVR and Jaguar tweaks the V8 to deliver 575 horsepower and 516 pound-feet of torque. This model is also paired with the automatic transmission to serve a 0-60 mph time of just 3.5 seconds and a top speed of 200 mph. Catch me if you can! 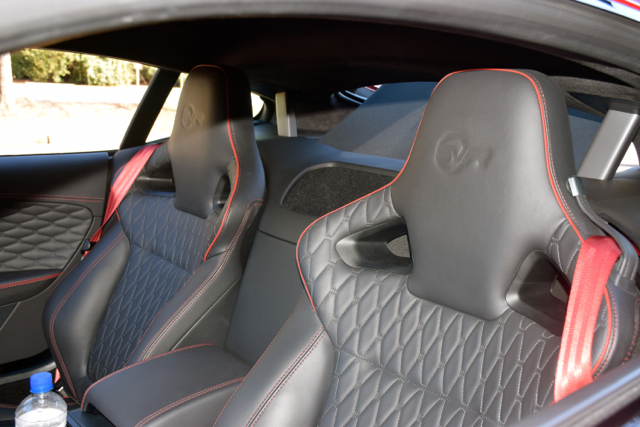 The final edition is a special British Design model outfitted with a carbon fiber console finisher, British Design Edition treadplates, and special contrast stitching. Here, you have your choice of rear- or all-wheel drive. The same performance found in the “S” lines are offered with this edition. 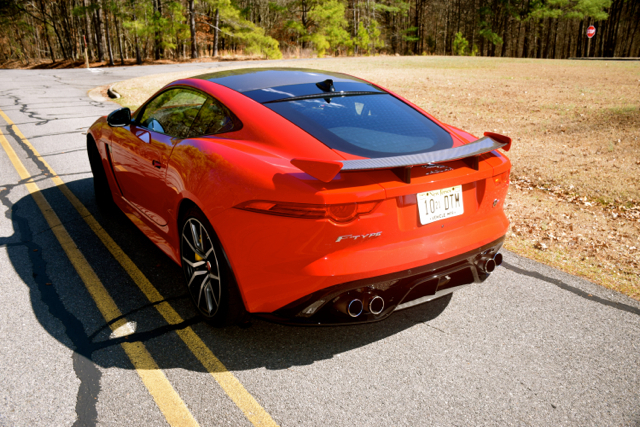 The F-TYPE is the only coupe in Jaguar’s product line. 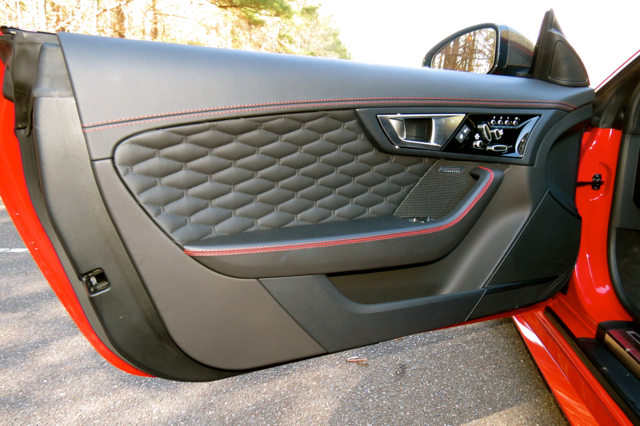 You can also choose a convertible with the same trims offered as the coupe. Just add upwards of $4,000 to your base price to find the comparable drop-top equivalent. My previous Jaguar test models included manual and automatic versions of the V6 model as well as the R Coupe. 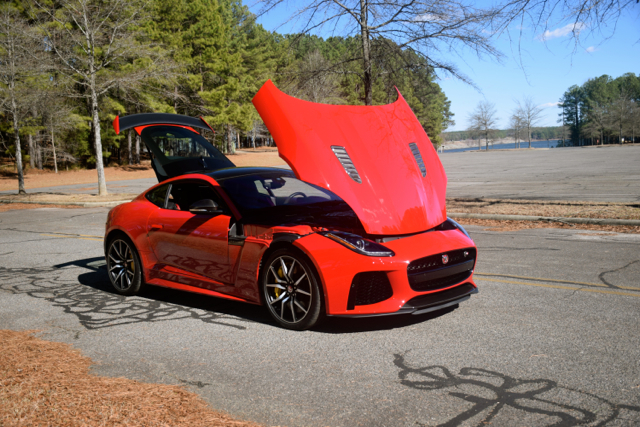 The R Coupe was already an intimidating machine for the segment, but Jaguar was not satisfied. Enter Jaguar Land Rover’s Special Vehicle Operations team. 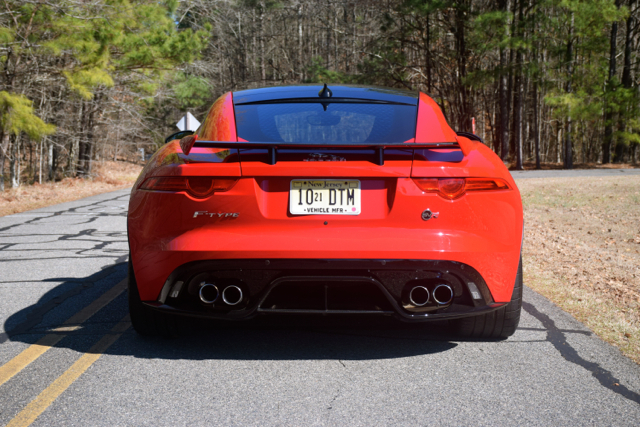 Best known as SVO — although the logo on the Jaguar reads SVR for Special Vehicle Operations R series, the modified model benefits from new intercoolers and hood vents for unrestrained breathing. Shift times are faster, while launch control is enhanced to get this big cat moving faster. Additional changes to the torque-vectoring differential and the all-wheel drive system are evident too. Fat Pirelli P Zero tires help keep the savage beast planted at all times. A quick glance of the rear of both the R and SVR models will show the expected quad exhaust tips. But the SVR’s exhaust system is unique and comes in lighter than the R’s. 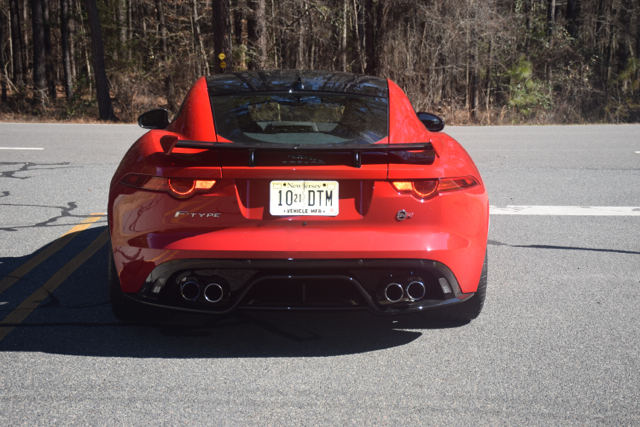 Here, Jaguar employs a lightweight titanium and Inconel exhaust system for weight savings. Indeed, the Inconel name represents a family of austenitic nickel-chromium-based superalloys, which are both resistant to oxidation and corrosion. They’re also entirely suited to work in extreme environments where heat and pressure are at work. 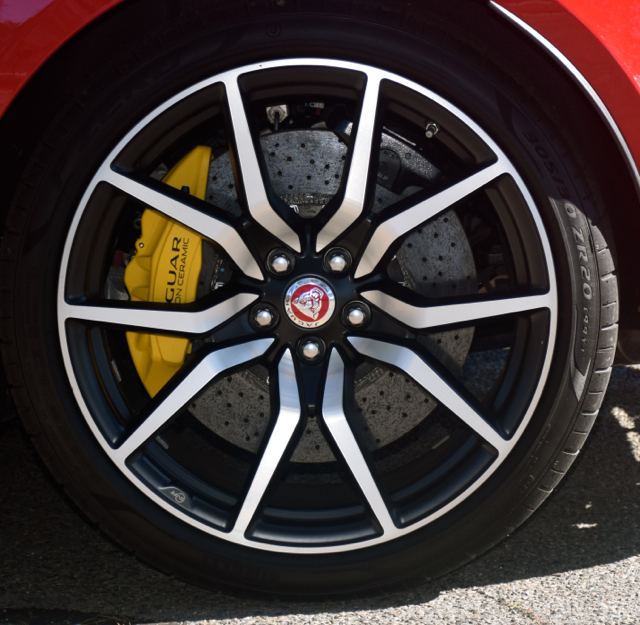 Such as under the belly of the F-TYPE SVR. 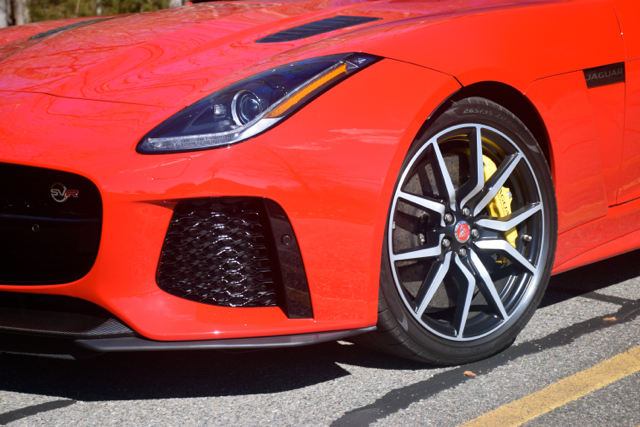 Other standout features in the SVR include unique 20-inch Coriolis alloy wheels, chassis and cooling system enhancements, and a suede cloth upper interior environment. 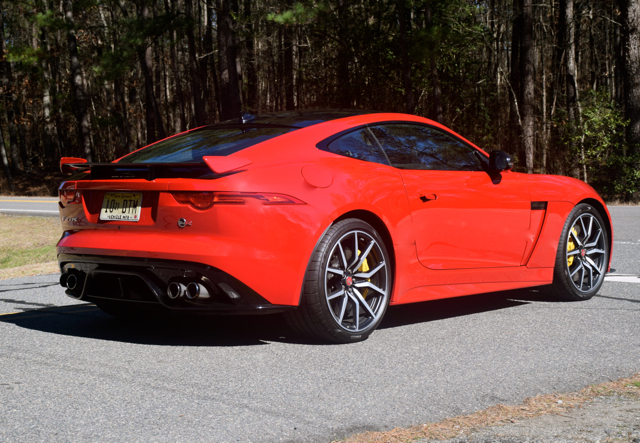 Many of the other details of the SVR have been tweaked for this model line only, including the available Carbon Ceramic Brake Package ($12,000) for a 46-pound weight loss. 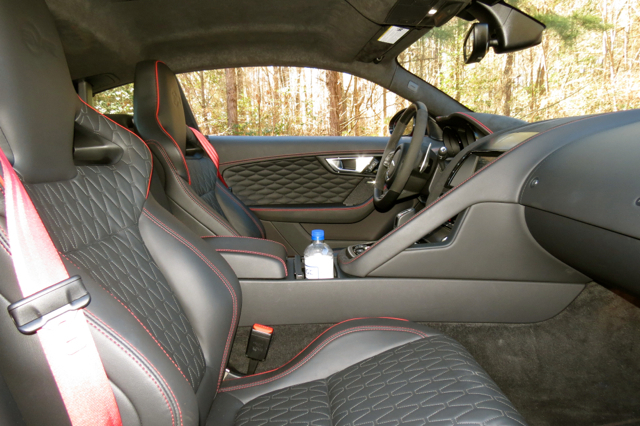 Other package upgrades include an extended leather package ($2,200), and exterior carbon fiber package ($4,400). When all is said and done your final price can move close to an eye-watering $150,000. I’ve discussed the cockpit extensively in my other write ups. 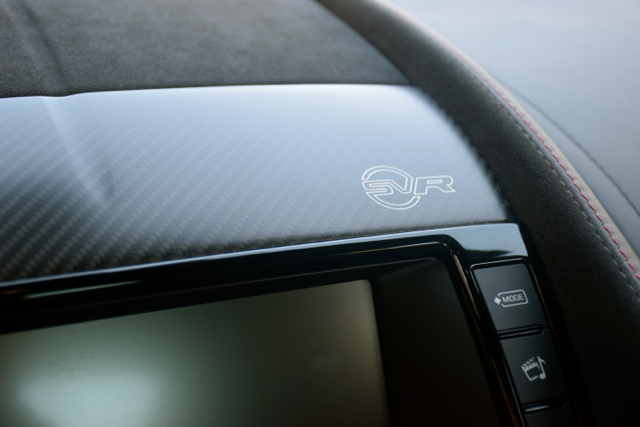 There isn’t much difference between the R and SVR models here, except perhaps for the greater use of carbon fiber here and there. 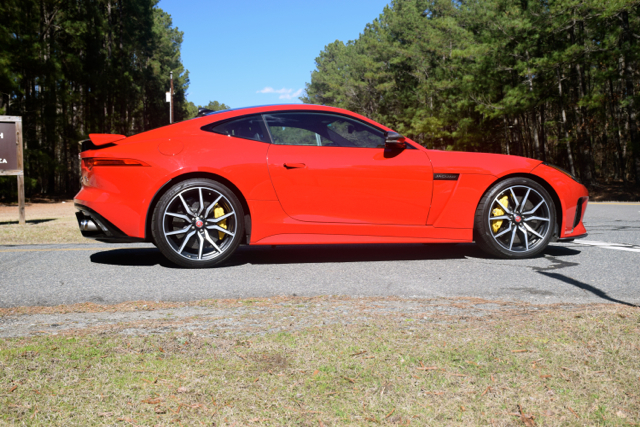 When it comes to the SVR, this model is all about what it does on the road. Let’s just say it blows nearly everything else away in short order. Engage the ignition and the exhaust system bellows. Be forewarned: your neighbors might complain if you drive off while they’re still in bed. There is no silencer mode here — the exhaust system has two settings — loud and louder still, the latter reached when sport (dynamic) mode is activated. 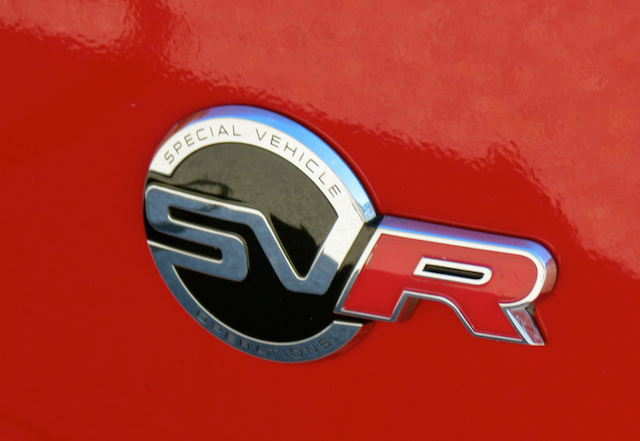 The SVR rumbles wherever it goes — more so when operating in dynamic mode. Every pitch, churn, burp or other utterance is magnified. Call it a purr if you want, but it starts with a grumble and quickly transforms into a roar once you press hard on the accelerator. And another warning: Don’t plan on flooring it unless you are aware of your surroundings. 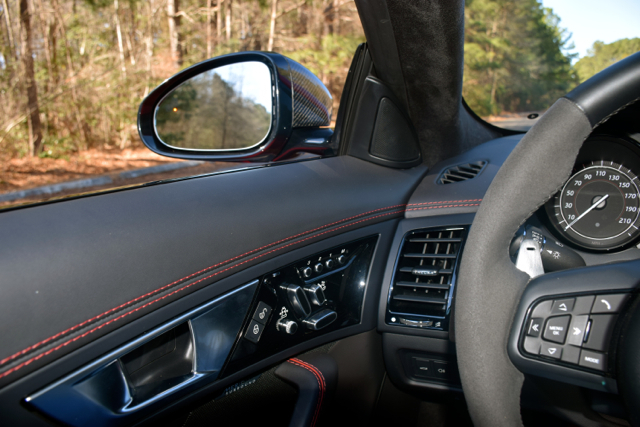 You’ll need to have ample room between you and the next car up front as well as space to move around. This also means that you’re a target for law enforcement who will take note both of the flashy color (my test model was dressed in Caldera Red) and the attendant cacophony. Why make it easy for the blue line to give you a traffic violation? Not only does this sports car own the highway, but it is a gem on your favorite back, twisty roads. All-wheel drive is at work here and the advantage is apparent as torque is sent to the appropriate wheel at the opportune time, keeping the big cat planted. 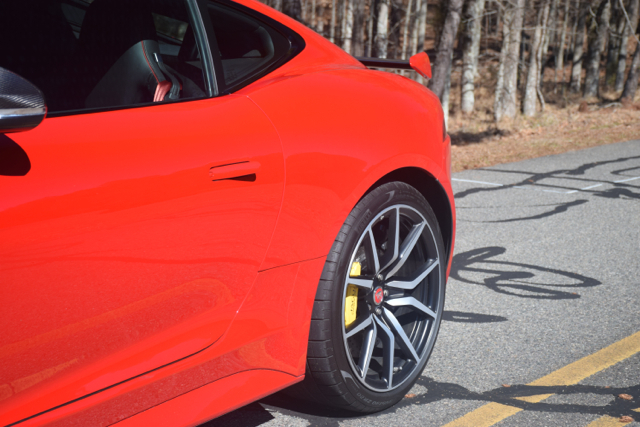 Every twist, dip, curve, and rise of the road are handled with precision — unless you get sloppy with the steering — in that case, it is doubtful you’ll ever need to tap the brakes. Just so you know I’m not recommending high-speed twisty tackling for the novice. 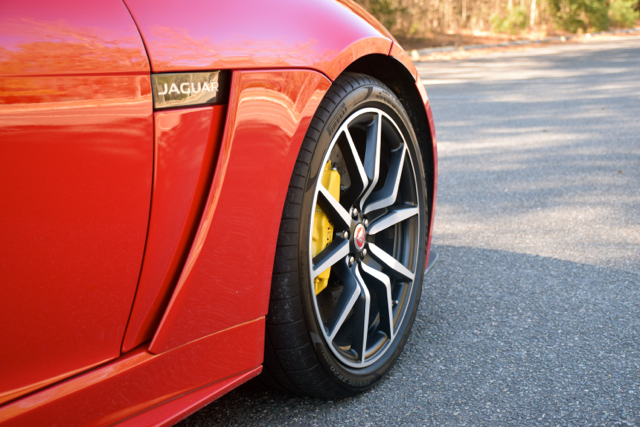 At the same time, the SVR compensates for whatever deficiencies you may bring to your behind the wheel experience. 1. I’m not about to push any car to its limits, unless I am on the track. Even then, I’ll happily defer to the experts. Besides, special manufacturer permission is needed for anything beyond road travel. 2. On occasion, I’ve been known to floor it. Quite easily, you can push the posted speed limits and well beyond. Let’s just say that whatever lofty speeds I do achieve are done on open roads and in very short spurts. I trust the manufacturer has thoroughly documented what a particular car can do and that’s good enough for me. 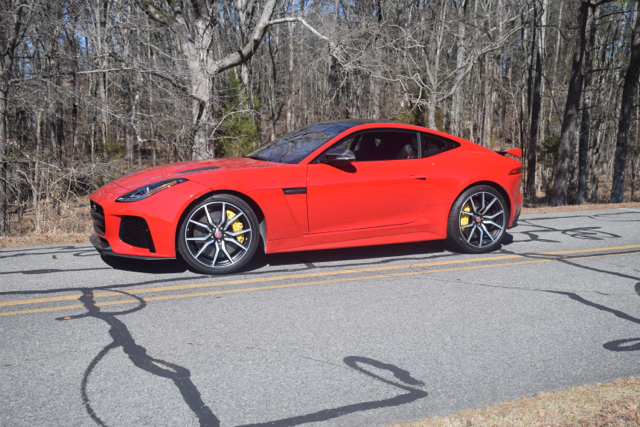 The Jaguar F-TYPE SVR is not for everyone, it is a performance outlier notwithstanding. Its price alone restricts this model to only a select few and then only to people who are committed to all things sports cars. 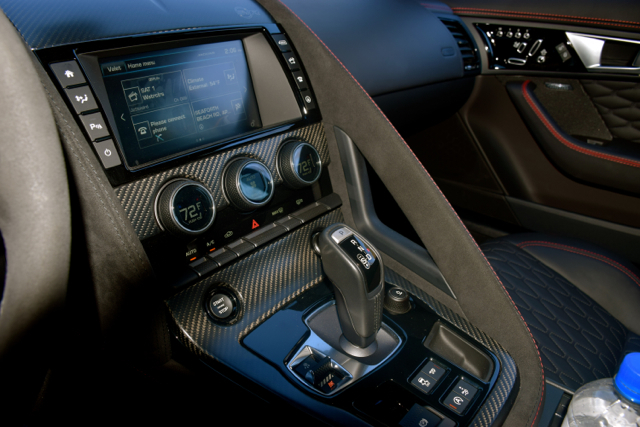 As for me, my favorite is the F-TYPE S convertible, outfitted with a six-speed manual gearbox. Not only do I prefer to row my own, but I enjoy the option of dropping the top whenever my mood and the ambient conditions intersect.